Jordan's King Abdullah II has noted that the country is "at a crossroads," after a week of anti-austerity rallies continued overnight despite the prime minister's resignation. Jordan's King Abdullah has appointed Omar al-Razzaz to form a new government, a palace statement said, after Hani Mulki resigned as prime minister in a bid to defuse major protests over price hikes. Al-Razzaz, a former World Bank economist, served as education minister in the outgoing government. ​The new government must launch a dialogue over income tax laws, review the tax system, the palace statement said. "Jordan today stands at a crossroads: either it can come out of a crisis and provide a dignified life to our citizens, or, God forbid, it can go into the unknown — but we have to know where we are going," Abdullah II said. Massive protests have been overwhelming the Jordanian capital and other cities since May 30, after the government submitted a set of economic reforms aimed at raising taxes and reducing spending in accordance with the International Monetary Fund's (IMF) requirements. The legislative proposal is yet to be approved by the country's parliament. 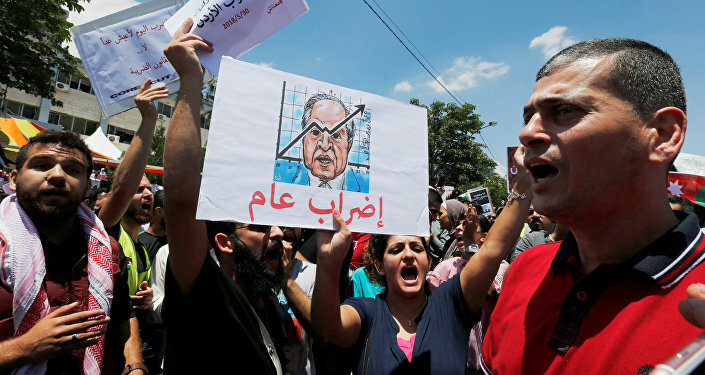 Jordan's prime minister and trade union representatives tried to negotiate a compromise on taxes on May 2, but the efforts ultimately failed and the protests continued.